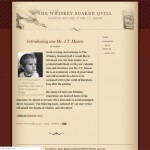 James is the constant gentlemen, so I made his website sensible, yet fancy in reverence to his high class sensibilities. Ok, so, I know this guy, right? He’s a pretty smart and funny dude but he’s working a string of manual labor jobs. I think he should be doing something creative as a career instead of moving boxes. His wife convinced him to try and turn his writing into a career, my other friend Lance said he’d help set up the blog software. Then I was all like, I’ll help. OK, that’s good enough for a set up. Lance graciously hosted a wordpress installation and I stuck the quentin theme on there with a custom header and wrote his first blog post as an introduction. Now that he has a means to publish his works and a possible drinking problem, it’s like a perfect storm of authorship. 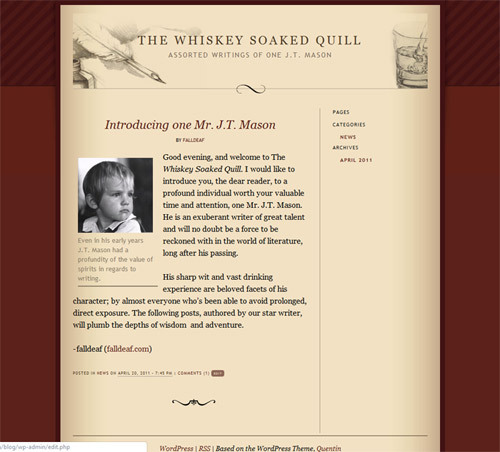 So check-a-check it out, it’s called the Whiskey Soaked Quill. Update: Sadly, the Whiskey Soaked Quill is no longer in operation. Fortunately, James has taken up a career in cooking and is doing quite well! An attempt to make an alcoholic functional? Hi Nicole! :)I just think that writers these days should be ashamed of themselves. Back in the day, *real* writers remembered what sobriety was like as easily as the day they first rode a bicycle. (Because it was around the same time.) It is my sincere hope that James will put down that glass of whiskey, pick up the bottle and write about elderly men and oceanic related misadventures, like a gentleman.